The study «Russisn coins (poludengas, chetveretses and polushkas) of the 14th–17th centuries» is a part of a larger study «Minor coin units of medieval Rus’ (chetveretses, polushkas and pula from the end of the 14th to the 17th century)», which was defended as a doctoral dissertation in 1999. 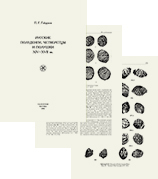 The other half of this work titled «Russian copper coins from the end of the 14th to the l6th century» was published as a monograph in Moscow in 1993. 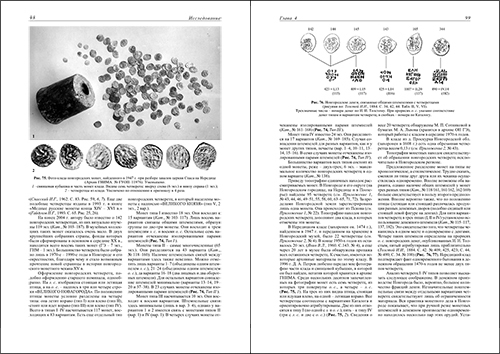 This monograph consists of two parts («The research» and «The catalogue») and five appendices containing specific data. The smallest silver coins – chetveritses and poluden’gas (polushkas) with the value of respectively one-fourth and one-half of the den’ga (the main monetary unit of the Russian middle age period) were the main subject of this study. Nearly 10,000 coins have been analyzed. 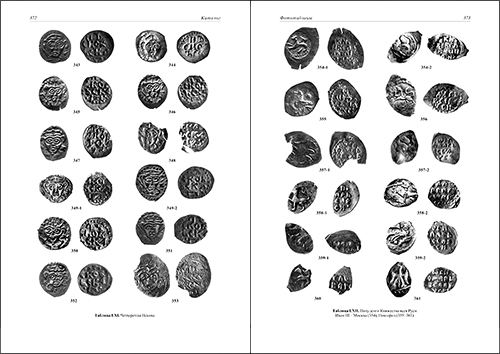 As a result of the analysis of all collected data, Russian silver coins typical for the monetary system of the 14th–17th centuries have been fully systematized and a detailed Catalogue has been compiled. This is the first attempt of analysis of small coins in the context of Russian medieval coin minting and coin circulation. The research was particularly innovative for the period from the late 14th century to the end of the first third of the 16th century. In the past, numismatists gave consideration to poluden’gas dated from 1533 to the late 17th century with no detailed analysis and only in general terms within the study of the history of the national monetary system. The monograph presents a detailed study of numismatic and written sources which allowed to describe to long-term circulation of silver coins of small value. Poluden’ga (literary meaning “half-den’ga”) with the value of a half of silver den’ga and the weight of 0,45–0,52 g was first struck in the Principality of Moscow in the late 14th century and it remained an integral part of the monetary system of Rus’ and of Russia for three centuries. The tiny silver polushka which by the mid 17th century weighed 0.08–0.09 g and was no bigger than 5 x 7 mm, was replaced in 1700 with a copper coin with the weight of approximately 3.10 g.
The second part of the monograph («Catalogue») contains detailed information concerning 9870 Russian silver coins, described under 457 catalogue numbers. 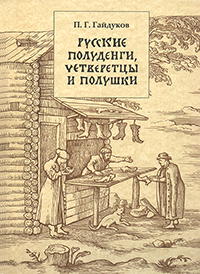 The Catalogue contains all the known poluden’gas and chetveretses of the 14th and 15th centuries from Moscow, Serpukhov, Zvenigorod, Mozhaisk, Dmitrov, Rostov, Nizhny-Novgorod, Suzdal’, Novgorod and Pskov, as well as 16th–17th century polushkas from Moscow, Tver’, Novgorod and Pskov. 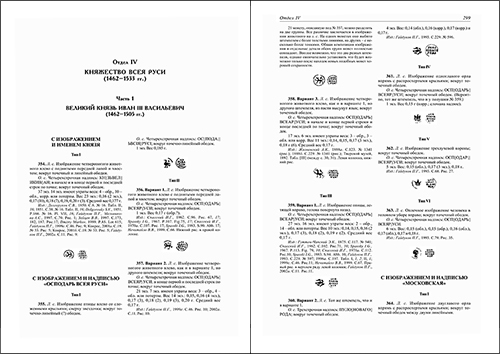 Separate sections contain a description of 14th–15th century coins of uncertain place of minting and counterfeit polushkas of 16th–17th centuries. The Catalogue is well-illustrated, each item has a detailed description and exact drawing of a coin in real size. 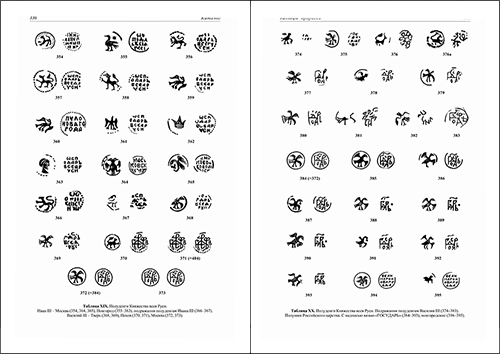 Plates following the text of the Catalogue contain drawing (Scale 2:1) and photographs (Scale 3:1) of coins. Table of Contents (p. 405–407).